My journey into Sisterlocks from a certified consultants perspective. I want to share my experiences welcoming people into the world of Sisterlocks, Brotherlocks or BabyLocks and my journey from Corporate America into Sisterlocks full time. Who would have thought. Paulette, doing hair. Certainly not me. Need information about Sisterlocks? Contact Me! Are you a client, potential client, consultant, trainee or wannabee and want to talk to an experienced, R-Certified consultant about anything related to Sisterlocks® or any other locking process? For the next 20-30 days or so, Locks4life will be testing a new feature that is first being added to the blog and then to the website. Schedule a video informational appointment either private or small group (5 or less). There is nothing to download. Just click the link you will receive in email. When did you say I could wash my hair? So often we hear a huge sigh of surprise when we tell people that they can wash their hair the very night that they get their Sisterlocks® installed and then again in 2 weeks. If washed properly, they can be washed as often as you like to wash your hair. I am not saying wash it everyday but once a week, once every 2 week or 3 weeks is fine. We aren't putting a bunch of products on our hair so it is not getting dirty as it once did. You just have to follow the proper washing instructions. Now this is where lines are drawn in the sand. Hearing people being told to wait 6 or 7 months to wash their hair or even 3 months is just incredible. How long would you wait to brush your teeth or wash your body? I hope not that long. You are not messing up your Sisterlocks® by washing them. You just have to what? Follow the proper washing instructions. Trust me, everyone around you will thank you in their hearts, minds, and noses. Email us paulette@locks4life.com or give us a call for details on the instructions that we give our clients. Certified vs Trainee : What is a client to do? This is my humble opinion. As of late, the question keeps coming up about finding a certified consultant. I have also been hearing of certified consultants not doing the best job. What is a potential client to do? Let me reiterate, this is my opinion which may be different from yours. Currently, I am R-Certified through Sisterlocks® which means I can teach a person with Sisterlocks® how to re-tighten their own hair. This is a higher level of certification which means it cost more for me to have. This my full time business and it helps clients to be able to take care of their own hair which is traditionally how we do our hair. Let me also say that I have no plans to discontinue my certifications. I was a trainee from 2002 to 2006. I quit my full time dream job to do Sisterlocks® and didn't have certification at all. 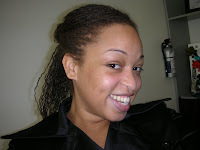 It wasn't till I got serious about doing Sisterlocks® that I even decided to think about becoming certified. I have been the same person providing the same service before and after certification. I thought of myself as a great trainee. It didn't make sense to become certified when my clientele was 3 strong. My price structure was initially based on building clientele for the my first serious year. I charged the same prices before and after certification. Certification didn't make me better. It just cost me more. When clients came to me, I was able to answer their questions, put in test locks using the Sisterlocks® tool and provide the service within a time frame that they could handle for a price that they could afford. I always give my honest true opinion. Sometimes that opinion hurt. I still remember the first person I ever told that they had to start over if they wanted the Sisterlocks® they envisioned. More importantly, I care enough to tell you no if your hair is not ready or if I sense that you are not ready. 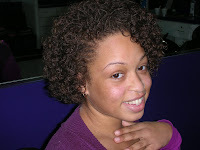 The person picked to do your Sisterlocks® has to be able to prove that they have taken the class from Sisterlocks.com. 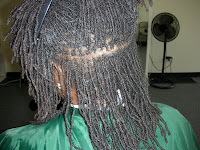 They will have paperwork validating that they have taken the class if their name is not on Sisterlocks® website. Currently, your name only stays on the website as a trainee for 2 years if you don't become certified or take a refresher class. They should listen to your concerns and answer your questions. 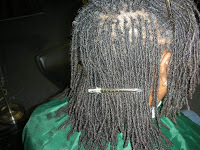 They should only use Sisterlocks® tools on Sisterlocks®. Don't pick a person to do your hair solely based on them being certified. It is more to it than that. If you don't feel comfortable and you feel rushed to make a decision, that may not be the place for you. Trainees do great work to but for whatever reason they may or may not be certified. When trainees call me they are excited to do a great job and take very good care to make sure that they are doing it right. Not to mention that there can be a price and a time commitment difference from someone certified. How to get a Sisterlocks tool? The answer is very simple. There are 2 ways to get the "Official Sisterlocks® tools"
First way. You can take a Retightening Class from any authorized R-Certified Consultant. You will get a kit that contains everything you need in order to re-tighten your own hair right down to an ink pen. You are taught to re-tighten your own hair ONLY. You don't learn how to start locks or fix locks and your are not eligible to take the class unless your Sisterlocks® have been installed by someone that has been TRAINED by Sisterlocks®. This class is always the cost as described on the Sisterlocks website. Currently, it is $250.00 and there are no exceptions. I happen to be authorized to teach this class. The second way. 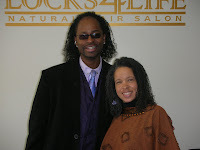 You take the official Sisterlocks® class from Sisterlocks.com. This class is four days and you learn everything. There is a schedule posted and currently the cost is $1495.00 unless they offer a stimulus class (a discount). If you even think that you want to do Sisterlocks® take this class. 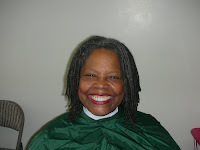 No individual or school other than those represented on Sisterlocks.com is authorized to teach you or sell you a tool. So, don't waste your money on imitations. If anyone tells you that they can teach you, trust me, they can't. Tools are not sold by consultants or trainees. It is against the trademarked agreement for a consultant or trainee to sell tools. I would never sell a tool outside of the Retightening Kit as an R-Certified Consultant. If you ask, I will tell you no. If you stepped out on faith, are you still there? I believe that once you step out on faith you can't go running back to what you used to call solid ground. If you really have stepped out on faith, you land on hallowed ground. I have been on hallowed ground so long that it is my normal. I wish that for everyone. So much has happened over the years looking back at my blogs, I just don't believe it. First I can't believe how long its been since I blogged. Oh well maybe I can. Building a business is time consuming but it has been incredibility exciting. The business is stronger than I ever knew it could be. I read my blogs and think WOW. Then I go to other peoples blogs and see I am not the only one that had a blog hiatus. I have truly been busy this past year and what a year it has been. I have been busy answering your emails, taking your calls morning, noon and night, consoling those in need of help, answering questions from other consultants/trainess and clients, and I am still working 7 days a week and I love it. My grandfather, Palmer Lee Talley Sr. passed and so did Archie's aunt, Alma Powell. We will truly miss them both and will never forget the lessons that they have taught us. We welcomed truly international clients some from as far away as Brampton Ontario and Braunschweig Germany. Yes Germany. He flies first class every 9 weeks to get his hair done at Locks4Life. I know that sounds unbelieveable. So I have attached his picture. What a difference a year makes. This was Ashlee and me after last years Christmas Party. 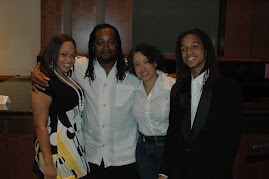 This year, Ashlee, my precious gift from above got Sisterlockstm. Yes, she did have to wait several weeks until our schedules corrdinated. It took 3 sessions because we had to squeeze her in between the paying clients. Robin and Atoya and myself all had a hand in helping. She wished she had done it sooner. Now my whole family has locks and we can all finally ride in the car on a nice summer afternoon with the windows down. Martina, one of my oldest clients who is truly a full circle client came back for some maintenance. She was one of my qualifying heads who stated her hair would never grow. That was 4 years ago. Look at it now. Martina has since moved to Arizona and maintains her own hair. She comes back to Michigan about twice a year and she always stops by to see me/us. My family loves her. 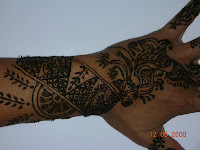 We are offering Threading Services for temporary hair removal and Henna Temporary Tattoos. Threading is gaining in popularity as it is neater, cleaner & lasts longer than waxing or plucking those unwanted hairs. There is no stubble or shadow or ingrown hairs. It is fast but I warn you. You do feel it. But as I have been told, beauty is pain. It hurts but just as you think you can't take any more, she is done. 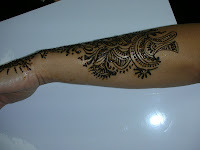 These are the photos of the henna tattoo. She did it all free hand and it lasted about 2 weeks. All that and more happened last year. You just can't stop Gods' plans. Stay tuned. Want to find out if there are any openings for appointments at the salon? Want to know if the Threading Lady is in today? 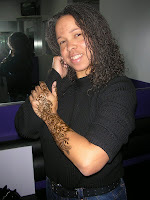 Want to try a henna tattoo? Want to get your natural nails done at lunch? Are your locks thin? Are your locks snapping off? Are your locks inconsistent? If you delay your re-tightenings because of the pain, it could be that latch hook that everyone says is OK to use on Sisterlocks. So many times you don't see the damage done by none by Sisterlocks tools till someone runs up behind you yelling the words "Is this yours?" Of course they are not about to hand you a $20. Instead, they have a lock or maybe two. Now what are you going to do with that? They know it's yours because they saw it fall when they were trying to figure out what was going on with your hair. It's funny if it has not happened to YOU. As you may not know. 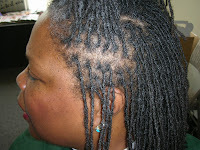 It can take a year or more for your Sisterlocks to recover if they have been damaged. As Sisterlocks trained consultants & trainees, we need to become proficient using the Sisterlocks tool and not do our clients the disservice of using none Sisterlocks tools no matter how easy it seems to be. It took 9 months to recover but you are looking at the proof . The ends have been latch hooked. The part by the tips of my fingers show the recovering locks that are thicker and not damaged. A BIG Thank YOU to XOXO for allowing me to post your pictures. We are on the move. Locks4life is going to the ATL. There we will be hosting a meet & greet for clients, consultants, trainees and anybody else that wants to join us. A great time is always had by all. The really cool thing is there will be two clients coming from Ohio, two clients from the 'D' (Detroit) along with me and my husband. Because of the response, I will be conducting a Re-tightening class as well as a Locks4life Business Development Seminar. Check out the calender for details. Also note that you will have to sign up for the classes/seminar in order for us to have the correct supplies. Look forward to Greeting you Atlanta. Hope you like the new website. This is a goal from last year. There are more changes to come. Remember Faith. I trust in God and I don't lean to my own understanding. I follow where He leads and I do not question his will. I know that God sends me all of my clients. He keeps me grounded. He sent me so many clients that I quit my job. I quit the full time corporate job I had worked my whole career to get to. Talk about stepping out on Faith. I went from being a project manager on a global project (one of the highest level of project management success) to doing Sisterlocks. Who would have thought. I know that God has ordered my steps in his way. Today is Thanksgiving. I am truly thankful for my family, and for my family business. I am also thankful to the people that read this blog. Sorry it has taken so long. There is so much to say. Look for all kinds of updates to be coming very soon. It has taken me some time to get things together but I am almost there. It never ceases to amaze me how far people have been willing travel to get their hair done by me. When I got my first call from out of state. I was amazed. 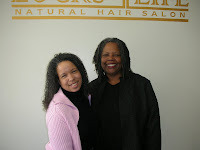 Amazed that someone would be willing to travel across state lines to obtain Sisterlocks services from me. Especially when many times there would be consultants in the states that they were traveling from. I will have my farthest traveler since beginning my Sisterlocks business. Can you believe, West Palm Beach Florida? She was so excited that I could get her in that she booked her travel before I could coordinate with anyone else in Florida where I would come there and save her some expense. She was a woman on a mission with a passion and a vision. She knew what she wanted. I am happy for her. Happy that her experience will be a good one, because she chose me. Not conceited but full of pride. 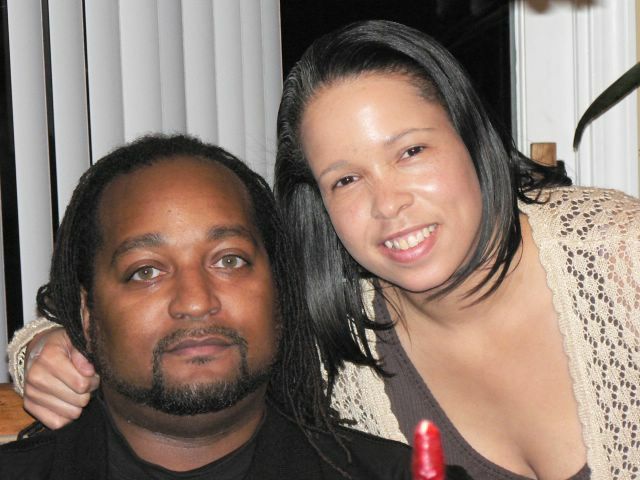 I also appreciate her and all of my clients that travel from far away distances for my services. I take so much pride in my work and I am glad that it shows in my photos. Let me say it again. It never ceases to amaze me when my clients travel for hours just to spend a couple of hours with me, other Sisterlocks wearers and bloggers for a meet and greet. (Tanya & Rose[Tanya's mom]). Sisterlocks is one of those things that takes time to mature. Just as your hair matures over time so does a consultants skill. It doesn't matter if you are a trainee or a certified. You don't sit down at a locking session and get up with the locks that you will have 2 years later. Looking back, I can see my skill has matured. I didn't have the skill that I do now. I used to schedule 2 days for a locking session. At the end of both days, I felt like I had been beat with an ugly stick. My arms would be tired, my back hurt, I was mentally tired from planning each section. Re-tightenings would sometimes take 6 hours. It doesn't seem like a lot until you figure that most of the time I would do a re-tightening everyday after work and a locking session on the weekend. Not to mention starting it all over again. Week after week. It wasn't economical for the client or me to take 2 days to do a head full of locks or 6 hour re-tightenings when some of my clients travel from as far away as Pennsylvania. To date, I have done a locking session and 2 re-tightenings' in one day. That was my personal best and was achieved just a few weeks ago. I am not sure if I would ever do that again. But, Archie (my husband) asked me to re-tighened his hair before the last meet and greet. My day started at 7:00 and ended about 11:30. It wasn't so bad. There is also the difference in my time since I am no longer working my 'full time corporate dream job'. I spoke to a consultant from New York that really understood how much my skill had grown. I told her several things about my business. She also told me that I had moved from what she called an amateur consultant to a master consultant. Imagine. Me a master. I had not even thought of my skill at that level. I believe that everyone needs a mentor in this business. To mentor is good. To be mentored is better. For the measure you give is the measure you get back. I am a big believer in mentoring but that is a subject for another post. On more than one occasion I have had to tell a person that they didn't have Sisterlocks. Unfortunately it was a costly lesson. I am hoping to help you avoid this pitfall. Make sure that the person that you chose to install your Sisterlocks at the very least has the Sisterlocks video, Sisterlocks products on hand and whose name is on the Sisterlocks website. You don't have Sisterlocks if any of the following applies to you. If you can't verify that the consultant offering Sisterlocks services is on the official certified consultant or trainee list. Please, please please contact the home office if the consultant is not on either list. He or she could be a consultant that has been trained more than 2 years ago and have never become certified. It's the small things. I want to take a short moment to thank all of those who attended the meet and greet this past Sunday, November 12. I have learned that the lock community is growing by leaps and bounds. It was especially nice to see other consultants clients. I think every client should really like their consultant. Lynda, Tammie loves you. She could not stop talking about how well you took care of her hair. I know that my clients really like me. Some of them even love me. Some of them better love me. Those who missed the meet and greet missed a treat. Thank you to Celeste & Monica, Dr. Cornwells's sister and niece. It was especially nice not having to worry about anyone saying the wrong thing. I follow all the Sisterlocks rules. You will not find a latch hook or nappy tool in my bag of clips. It was nice that one of my qualifying heads for certification was in the room. Her hair was gorgeous. It was really nice that Celeste brought my order of Sisterlocks products with her. Thank you for presenting and answering questions. Tanya and her mom traveled from Ohio to attend. Tanya also did a wonderful presentation on products and styles. She also meet some friends, Recee and Tammie who have blogs. Sorry to all of those that didn't get to take a picture with. I will catch you at the Christmas Party, December 16, 2006. Sorry I have not posted in a while. I have been very busy stepping out on my faith and quitting my full time corporate job that paid me more money than I had ever made in my life and building my clientele. I want you to know that God does provides to those that follow his lead. I also didn't realize that I had not turned on the automatic posting feature to my blog. Thanks to everyone that posted commits on my blog. I promise to keep it updated. I love my clients and have been putting them first. I cannot believe how many people that I have helped with their Sisterlocks. After working 7 days a week for almost a year, looking back makes me know that it is only by the grace of God and the patience of my husband that I am able to know from where I have come. There are a few things that I know. I know that only God could have given me the strenght to work that hard for that long. I know that my husband is a great man. I know that my kids have an appreciation of hard work and they will seek to fullfill their own goals. I know that nothing worth while is easy. I know that I have to mentor to others and help them with their business and that will make mine better. (note, one person cannot make all the money). I know that there is a consultant that mentored me, Thank you Khumura. I know that there are consultants that are not true to the process. I get their clients. I know that Sisterlocks only goes by the name 'Sisterlocks'. Anything else is a fraud and you are paying too much for it. I know that my ministry is through Sisterlocks. I know that God sends me all of my clients therefore I am thankful. I know that I will turn you away if I don't believe that you are ready for Sisterlocks. There are some things on my mind that I just want you to know. I just want you to know that you should run away from anyone that does Sisterlocks with a latch hook tool. Some people say that it is easier to use and they are more comfortable using it because they have used it for other styles. It is the wrong tool. I have seen the damage that the latch hook tool does to locks not to mention that it hurts. In my opinion we should practice using the correct tool for the job. What would you do if a Dr. was going to put stitches in with yarn. If someone can use a latch hook then the Sisterlocks tool should be a no brainer. Food for thought: You can only purchase and learn how to use the Sisterlocks tools if you have taken the class. In my humble opinion, consultations should be more about you and what you want to do with your hair today, tomorrow and in the future. They should be free and include the video, some test locks and answer all of your questions whether Sisterlocks is for you or not. It should have nothing to do with what pattern you are. Patterns can change based on your hair and what it is doing. Leave the decision on what pattern to do when to the consultant that is taking care of your hair. My questions for you during a consultation. What do you want to be able to do with your hair? I almost always have to give an example. Style, dye or freestyle (hang straight). How is your hair now? Is it natural? When was the last time you had a perm? What do you know about Sisterlocks? How does asking me how long I have had my locks have to do with you and your hair? What you should know about me. I am listed on the Sisterlocks website as a certified consultant, I can provide references, pictures of my work is my website, all I do is Sisterlocks and God sent you whether you are on a journey or not. Food for thought: Consultations are like interviews and I see no reason to pay for them. You can't put oil, lavender oil, rosemary oil or oil by any other name in your hair without expecting the locks to slip or slide out. Moisturizers and reconstructors are as big a no no as the oil to locks that have not matured or are fully encased. Sisterlocks is more than just twisting hair. You can watch me and think that you are getting the base line for your own business but you can't. When I took the class it was 3 full days. Now it is 4 days to add more practice time and business information. Just twisting hair doesn't take that long to learn. There is so much more the Sisterlocks than what you see a consultant doing during a consultation or while she is retightening someone in the salon. We learn how to fix things that happen along the way. So much has happened this past year and I have learned so much about the business and about myself. Ask me how. Before embarking on any journey. You should pray. Not that prayer that asks God to watch over your family and keep you safe during your daily travels in the world. Not the one that thanks God for waking you up this morning and starting you on your way. I mean really pray. Pray the one that humbles you to step out on the faith that you have been saving for the right opportunity. Pray the one that truly makes you to yield to his word and allows God to be the potter and you be the clay. Pray the one that makes you let go and let God even though you don't know what you are going to be when God is finished. So I prayed... If this is for me Lord send me some clients. But only the ones for me. Lord you know I am working out of my home. The home you blessed me with. The next thing I knew was that I needed a date book to keep all the clients straight. I was working a full time job and doing a retightening or grooming during each day of the week (except for every other Wednesday and I get my press & curl). On the weekends a locking session. My family would ask, "Who do you have today?" Clients would ask me how I keep my current schedule. I tell them that it is by the grace of God. You will be surprised what you can do when guided by God. I get tired but I don't complain because this is what I asked for. When you ask for guidance you should be willing to follow even if it doesn't make sense at the time. Officially, my journey began August, 2005. Or should it have began May 2002. That is another story. What an honor it was for a Sister Sisterlock Consultant to schedule an appointment for me to do her hair. I understand the need for a consultants' hair to be on point especially because I don't have locks my self. My work has to speak for itself. Imagine someone looking at your work with the keen eye that consultants have and I made the grade. It was nice talking shop with someone who had been some of the same places as me. This dream has been two years in the making. I remember thinking. Is this a dream? Do I really want to do this? My kids were getting older and didn't need me as much. I needed something else to do. Is it hair? Do I really need something else to do? I did always want my own business and I have tried a number of different things only to get bored and move on. Ask he who keeps me grounded, my husband. Then I decided to take on the hair business and I learned a couple of things about myself. It wasn't' that pretty. Scared to succeed, I didn't do one thing until it was time to look back at my accomplishments for the year. It was December 2004 and I had not accomplished a single thing. 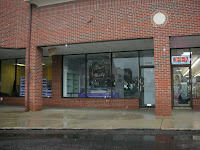 The journey continued as I learned that you will not find a single flyer on your car detailing my Sisterlock services. Passing out flyers. It seems so simple but I couldn't do it. What if it snowed or rained and the flyers got stuck to peoples windshields or if security came up and told me I couldn't pass them out or if I passed by the church parking lot and the flyers were all on the ground creating trash. Archie, he who keeps me grounded, told me big Sisterlock businesses had been created by solely passing out flyers. Well, not mine. I moved to the arena that I was more comfortable with but knew nothing about. The internet. Embarking on my search for website services took longer than I expected. I needed something that allowed me to be my own webmaster and from humble begins, I began. There were many long nights on hold with the 24/7 help desk but I finally deployed a website on Martin Luther King Day 2005. Nobody told me I had to market it. So, I did that too. Then I did the most important thing which is what I really did first which is why I was able to do anything. I prayed. By June my certification paperwork was submitted and my appointment book was full into the next month. In the Beginning I only wanted to do my husband's hair. Then my son wanted locks. Then a friend of my husband wanted his hair done. Then someone that worked at my son's school wanted his hair done and then I had to decide. Go into buiness? Putting off the decision for months, I learned a couple of things about myself. Married 25 years in 2011. 2 adult kids, a girl and a boy. I am currently living my highest and holiest present life in between Michigan and Arizona.